What is Illuminati? A few people today are confused as to whether Illuminati is real or myth. The truth is that Illuminati may not really exist but is a myth which has been thought to attain bigger ability for secrecy and power. It is often the duty of conspiracy theorists to sometimes distort the truth or embellish the ideas with lots of lies if only to make a strange and surprising impact on people’s minds. The book, Proofs of a Conspiracy written in 1798 by John Robinson, seems to be the source of almost all conspiracy theories that exist today. A good number of the Illuminati conspiracy theories attribute to the group the ability to control the world through a scheme called the New World Order. Many conspiracy theories brand Illuminati with different names. These names include zionism, satanism, Masonist, Atheist or some secular group who conspire to dominate the economy– depending on the version of the theory you are used to believing. No Illuminati real website to support this.Illuminati is facing strong criticisms from all sides- some even describing it as the highest level of Satanism the world has ever known. People believe that Illuminati have a tendency to put subliminal symbols and clues to their existence around the world, and on money, for no tangible reasons. Almost everything today—including triangle, pyramid shapes, TV shows and a host of other things that have been allegedly linked to illuminati. There is yet no illuminati real website to support this. A lot of modern conspiracy theories which center on the New World Order often convey the vital structure and nature of the Illuminati theory. However, many of such theories have always failed to make any direct mention of the Illuminati to be better off than other groups. The other groups referred to here may include groups such as the Trilateral Commission. It is rather sad that Illuminati has always been a victim of malicious attacks from conspiracy theorists who found their opinion on weak solid structure and sometimes, resort to telling lies in order to drive home a point that is logically weak. No illuminati real website to support their claims. A very good example of such weak theories would be that of rapper Jay-Z, who is supposedly very high in the Illuminati’s hierarchy of celebrities. 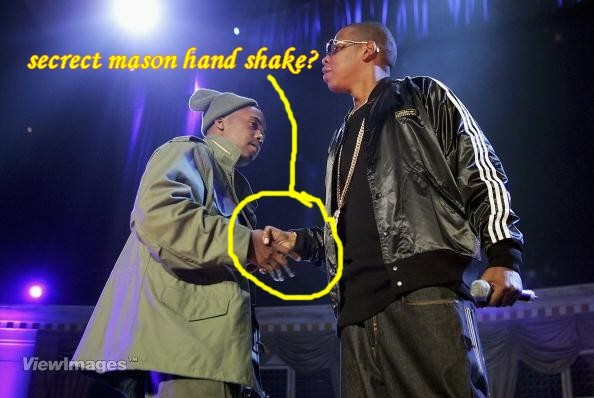 Anti-illuminati theorists believe that the hand gesture that Jay Z flashes to be symbolic of the Illuminati. It has therefore been used as proof – even though it is in a very loose sense of the word. In the real sense, the hand gesture is meant to represent the diamond of Roc-a-fella Records, which is thrown up as often as the east or west hand signs. They also accuse Jay Z and many other famous artists of being famous because they have sold their souls among other things to the devil. Just as with Tupac, conspiracy theorists just turn to lies to drive home their points– no illuminati real website to support this claim! Quite a number of people are of the opinion that Blue Ivy, the name of Jay Z’s newborn daughter can be turned backwards as Yvi Eulb—which in Latin means Lucifer’s daughter. There is absolutely nothing short of malicious attacks to imply this– even Jay Z himself has denied all these claims. His response to the conspiracy theorists can be found in Rick Ross’s song, “Free Mason”. It’ll be so ridiculous if everything can be attributed as being a symbol of Illuminati. It is about time we woke up from slumber and smell the coffee. Let’s leave Illuminati out of our lives, only then we can be happy!